I recently attended a friend’s party and brought two different treats – one geared toward men (I say that jokingly, they’re for anyone who likes delicious things) and another for those who crave a healthier option. Both platters were quickly gobbled up, so it’s safe to say they were a hit. A long time ago – after some initial hesitation – I grew to love the combination of orange and dark chocolate. I don’t know what it is about the mixture of the citrus and chocolate, but I would almost describe it as refreshing. And when it’s refreshing, it can’t possibly be bad for me. So obviously I should eat entire plates of said concoction. The recipe for this is extremely easy. I mean it. Super easy. Like, I’m going to stretch this out in a major way to make it look legit. You ready? 2) Peel oranges. Set aside. 3) Melt chocolate. For dipping purposes, you want to thin out the chocolate a bit. Add a teaspoon of vegetable oil to chocolate chips in a microwave safe bowl and heat in microwave in 15 second increments, stirring until completely melted and smooth. 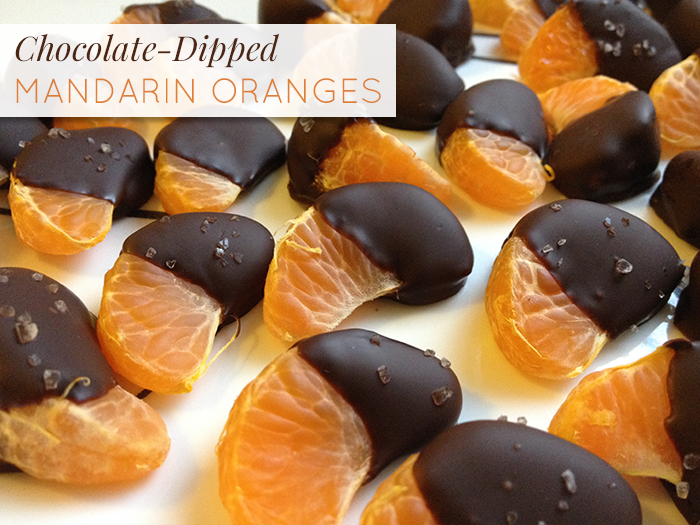 4) Dip each orange slice halfway into chocolate, and place on prepared pan to dry. If desired, sprinkle some sea salt on the dipped end as well. 5) If your house is cool enough, let them sit out to dry. Otherwise you can expedite the process and place the sheet in the fridge and they should be set in about ten minutes. Serve and enjoy! *My general rule is 2 tablespoons of chocolate for each whole orange.